The 4th edition of our annual People in Beta festival is over. But it’s not the end of PEOPLE in Beta series! We´d love to introduce you to those behind the curtain who made the magic happen. So within upcoming weeks we´ll publish a series of interviews with our star festival crew, uncovering who they are and getting some tips and tricks on how to make an awesome event. Gabriela Guitierrez totally rocked the stage in terms of event design. She guided the whole team to make sure the festival location felt cosy, stunning, clear, comfortable.. oh my, so many things at once! Read on to learn if any of our beautiful decorations hit the garbage bin and what a child should drink if it lives with dolphins. What was your inspiration for creating the event design this year? The inspiration for this year was a mix of Bauhaus style , Gothic Vitrals, Berlin 'cool' and of course the betahaus touch. We wanted to create a playful atmosphere, that could be used during the whole day for different events, so the functionality was a really important side of it as well. A lot of installations at the festival belonged to categories like “Upcycling” & “DIY”. Was it a coincidence or your intention? One priority of the project was to be eco friendly. The challenge was to make something nice for one day, but to make sure that the materials could be used again for other occasions. In order to make this happen we collected most of the materials we needed and made sure we figured out a way to pass it on to other projects and initiatives once the festival is over. I wanted to live with dolphins and drink coconut water the whole day. Spend time with my friends, have a nice dinner, travel, watch a movie, go swimming... I have too many favourite things. People that take the risk to be themselves. Being able to laugh every day. We shouldn’t take ourselves so seriously. Tea , fresh mint tea. 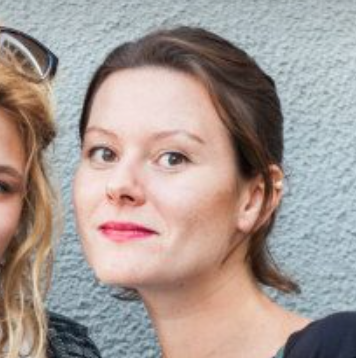 Want to join Gabriela and many other entrepreneurs at betahaus? Click here!